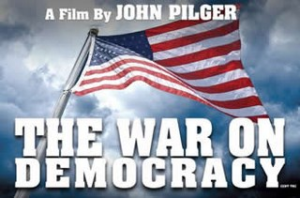 ‘The War On Democracy’ (2007) was John Pilger’s first for cinema. It explores the current and past relationship of Washington with Latin American countries such as Venezuela, Bolivia and Chile. Using archive footage sourced by Michael Moore’s archivist Carl Deal, the film shows how serial US intervention, overt and covert, has toppled a series of legitimate governments in the Latin American region since the 1950s. The democratically elected Chilean government of Salvador Allende, for example, was ousted by a US backed coup in 1973 and replaced by the military dictatorship of General Pinochet. Guatemala, Panama, Nicaragua, Honduras and El Salvador have all been invaded by the United States. ‘The War On Democracy’ was a Youngheart Entertainment, Granada and Michael Watt production. It was released in UK cinemas on 15 June 2007 and broadcast on ITV1, 20 August 2007. Directors: John Pilger and Chris Martin. Producers: Chris Martin and Wayne Young. Editor: Joe Frost. The film was made with the support of the humanitarian financier Michael Watt.